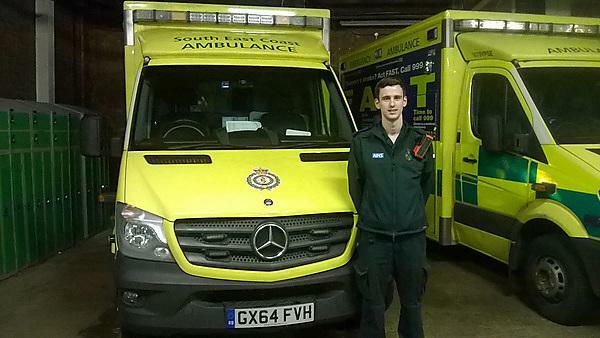 Edd Bartlett went into full-time employment after graduating from his degree, working as a paramedic for the South East Coast Ambulance Service. I have been very lucky since graduating to go straight into full-time employment. I currently work for the South East Coast Ambulance Service (SECAmb) as a Paramedic, and I have also started a masters in Medical Ethics and Law at Kings College London. SECAmb have been very supportive of this and have arranged my shifts so that I am able to have Thursdays off to go to university. Since graduation, I have continued to develop an interest in resuscitation, end of life care in the community, and alternative pathways to avoid inappropriate A&E admissions, particularly for mental health patients. I am hopeful that my masters will give me a greater grounding in the ethics and law surrounding these areas, and help me to decide which path appeals to me the most. For any paramedic I am sure the most daunting day is their first shift on a single crewed car. Working on your own without a crewmate with whom to bounce ideas or to give you support when you need it is challenging, but it can also be rewarding and help you to recognise areas in your practice which you need to develop. Balancing university and a full-time job is also very challenging. I was very pleased to have a letter published in The Daily Mail responding to a headline they had published about resuscitation orders. I have also had a couple of critically unwell patients recently for whom, with my crewmates, I have been able to quickly provide the correct interventions and as a result have been discharged from hospital neurologically intact. They are now making a good recovery, which is what makes the job worthwhile. Gain experience in areas which will help you gain an insight into the paramedic role, for example working as a community care worker. A large percentage of paramedics’ workload is caring for elderly patients and patients with social needs, so experience in these areas will help you with the communication basics, allowing you to focus on the clinical side of the job when you are at university. The Plymouth paramedic degree has a wide variety of clinical placements from midwifery, to mental health; these 'extra' placements supplemented the experience gained 'on the road', particularly in patient populations which we see less frequently. The twenty four hour library and opportunity to be a student representative were also very beneficial. It would be impossible to become a paramedic without practical 'on the road' experience. The variety of placements gives you a very well rounded exposure to health and social care issues in the community. My favourite memory is being involved with organising the Larry Lamb Study Day (a study day in memory of a student who died of sudden adult death syndrome). It was great to be part of a team organising a conference and running it on the day.